Who advocates change in your organisation? How do they advocate it? Who do they advocate it to? All important Change Leadership questions but just as important if not more so is the question of what impact is that advocacy having? 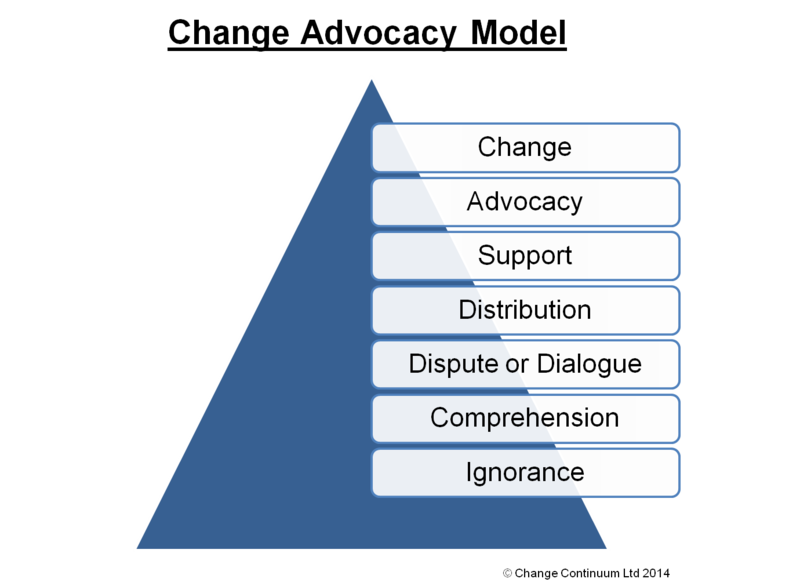 After all, the purpose of advocacy is to build authentic support for the change(s) you envisage. Quite simply others experience of our advocacy starts with some level of ignorance (or not knowing what you are advocating) and with increasing levels of interest, belief, support and motivation may progress to becoming advocates themselves and creating the change you advocate. There’s lots to look at behind these transitions so let me know if you want to explore them further in the context of the change that you are leading. In the meantime, here’s an alternative way to understanding these transitions that allows me to share some reflections on blogging that have been bouncing around my mind! What advocacy is your blog creating? I’ve been blogging in my own small way for nearly 4 years now. My intention in blogging has been a combination of thinking aloud, sharing and advocating practices & perspectives. I often wonder what impact I’m actually having… My desire is to have an impact but what impact is my blogging having? Quite simply, who has not yet read your blog posts that perhaps would find value or would help them create change. I struggle with this a little because I deliberately envisage a broad audience. In other words, a non-specific audience… If I was more specific about who I want to target as an audience perhaps I could more easily understand if they are ignorant of my thinking? It’s a classic leadership issue in that in my blogging I’ve not focussed enough on who I want to create an impression with… mea culpa! Something for me to focus on going forwards. I have an old Blogger blog that still gets hundreds of reads each month even though I’ve not posted there for nearly 2 years… real readers? I really don’t think so. Accuracy asides, the number of “Reads” are probably the most basic and dullest measure of a blog post’s success unless your ego needs it or your business model requires it. It has meaning but probably not as much as we’d like to think. Isn’t it the same with the traditional leadership approach to Change communications? If we tell everyone then everyone now understands and supports what we’re doing? That approach isn’t without some meaning but it’s a dull measure of success especially if you want to nurture advocates for change. Blog post comments clearly don’t always mean the reader has liked what you’ve written. It doesn’t even mean they’ll add to your writing/thinking… It’s often the blogging equivalent of email – a position is stated that perhaps rarely leads to a conversation. Actually, I wonder if spam comments generally use more or less engaging language than non-spam comments? Still, commenting takes effort whether you like a post or not and for the writer a blog comment is surely some sign of success or provocation. Yet again, how often do we mistake any level of engagement for agreement or advocacy. How much of what we’re hearing and like to hear is actually the equivalent of spam? How often do you create a space for others to add to your thinking, to help deliver the change you envisage? In leadership & blogging we need to create the spaces for both dispute as well as dialogue. In our organisations, the dissemination of our vision & plans for change is to be welcomed and encourage as a way of raising awareness. We just need to remember that in itself there is an opportunity for neutrality to remain. Next to a Reblog, perhaps there isn’t anything better than someone just saying “I like what you wrote.” Forget any darker motives and just accept that simple kindness that we generally don’t hear or give enough of. Someone else has just stood up and simply supported what you’ve asserted. Great! As a leader, you know those moments when that happens – they may even become significant memories. The challenge is in creating the environments where people (without darker motives) can authentically give their voice of support? We value that support so much yet often fail to create the space for it to happen. Perhaps we need to find space for a “like” button in our day to day lives as leaders… Perhaps we just need to create the trust and opportunity that it requires. You wrote so well that I’ll advocate your writing and even distribute it via my blog and share/sponsor it to my own networks. That’s a huge compliment in my book and takes a particular generosity. There is of course the potential of mutual benefit but what is wrong with that if it’s based on genuine positive regard. Apart from “in real life” advocacy, I think this is the closest we get to someone giving their advocacy to a blog post. As leaders, we’ve helped create an environment for people to see how they can support the change we envisage. How do you now help others move to being active advocates? Perhaps as with blog posts they’ll do it themselves… Perhaps more often as leaders we should ask others what obstacles do they face in becoming an active advocate? Isn’t that what we are focussed on helping them achieve? Did the blog post make something happen that wouldn’t of if it hadn’t been written? I wish I knew! Actually, sometimes I do know… on occasion a peer, friend or client will let me know that a piece of writing has done something meaningful for them. That they’ve done something with it. That they’ve created their own change. In leadership, I think those are the moments that I treasure the most. Not just when my change lands well but when others let me know how I’ve helped them create their own change as a consequence. We don’t need a tool or a measure for it. We just need to be open and trusting enough for others to approach us and share the impact that we’re having – good & bad. I guess that we could all do with keeping that in mind, bloggers and leaders alike. Hi David – maybe we should say it more often and maybe we should provide feedback to those who challenge us and make us think. Anyway, I like your blogs – I think you write well. L&D needs to be less “nice” and challenge each other more – in a constructive way that is. That is what I am hoping to do one day when I start blogging. This is my active advocacy for thinking about change and impact.